Bypass closet doors slide one in front of the other when opening. Each door slides along a track. Sliding closet doors are space-efficient when opened, allowing easy access to the closet space behind each door. A closet opening usually has at least two sliding closet doors, while larger-width closets have four or more doors. Bifold closet doors fold in on themselves while attached to a track at the top of the door opening. 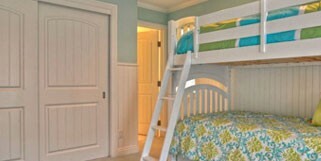 Their main advantage is that they allow simultaneous access to all spaces in the closet. However, the door opening mechanism is more complicated, and the folding doors do protrude out into the room while opened. 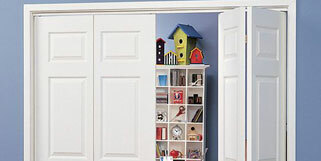 Swinging closet doors are interior doors used for closet openings. Swinging doors allow simultaneous access to the closet space, and unlike bypass and bifold closet doors, can allow racks, hooks, and pockets to be attached to the door. The main drawback is that they swing outward, requiring clear space in the room in order to open. Interior Door Replacement Company offers complete closet door replacement and installation services. Over the past 20 years, we have installed tens-of-thousands of closet doors. Our experienced door experts take care of every step in the process, from measurement of closet door openings to final installation and cleanup, allowing customers to avoid frustration and mess. We offer a wide range of closet door options to fit every taste and budget. Hollow core and solid core molded doors from our Signature Collection can be used for closet doors. We also offer other types of closet doors including glass closet doors, mirrored closet doors, and louvered closet doors. Delivery, installation, and all necessary closet door hardware are included in all closet door purchases. We are a one-stop door replacement service that takes care of everything, saving you the hassle of dealing with a potentially frustrating installation process. Closet doors are painted at our state-of-the-art painting facility in our Mountain View shop. We spray on the paint in a dust-free specialized paint booth, resulting in perfectly painted doors that have a smooth, beautiful surface with no brush marks.